Lt. Col. puzzled why media coddles 'head of serpent' Barghouti as peace seeker, not cruel despicable murderer. 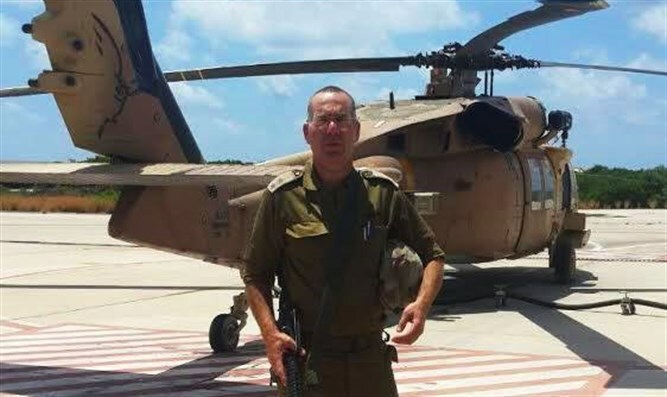 Uri Schechter, IDF Lieutenant Colonel in the reserves and Deputy Commander of the Nahal Brigade, wrote in his Facebook account about the capture of terrorist chief Marwan Barghouti in Operation Defensive Shield and wonders why Israeli media give a platform to relatives of the terrorist who is serving five life sentences for involvement in the murder of many Jews. Barghouti is now leading the hunger strike of terrorists imprisoned in Israeli jails. He even published an article in the New York Times in which he detailed his reasons for the strike. Shechter wrote: "Exactly 15 years ago, I was drafted as a deputy battalion commander for Operation Defensive Shield, which we commenced following the murder of hundreds of Jews and the wounding of thousands," recalls Schechter. "During the operation, my brigade occupied the city of Ramallah, where we arrested about 700 terrorists. "I will not forget the joy when the Duvedevan undercover unit reinforced by the brigade arrested the head of the serpent, Marwan Barghouti, who was responsible for a large part of the attacks directly. We felt at that defining moment that the operation had achieved its goal." According to him, Barghouti "got off cheap" and was convicted in the District Court for five life sentences and 40 years in prison. "So how the h*** does he become legitimate to some people and politicians? "And, above all, how the Israeli media coddles him and his family as if he were someone who is kind and peace-loving and not a cruel and despicable murderer who murdered women, men, and children ... I apologize in advance, I just don't understand ... I wish the despicable murderer to go with his hunger strike to the very end," wrote Schechter. Earlier today, Prime Minister Binyamin Netanyahu attacked the publication of an article by Marwan Barghouti in The New York Times. Netanyahu stated that "I read the article in the New York Times Sunday which presented arch-terrorist Barghouti as a 'leader and parliamentarian.' The newspaper only retracted after we objected to this characterization," said Netanyahu and added "calling Barghouti a political leader is like calling Assad a 'pediatrician.' Syrian dictator-tyrant Bashar Assad was trained as a physician. "These are murderers, these are terrorists and we have not lost our conviction that we are on the right side, the moral side and they are on the wrong side, the immoral side." The prime minister added that "this moral clarity, the willingness to protect our land, to fight for it against those coming to wipe us out, this is one of our great strengths, together with love of Israel. Love of Israel expresses itself in this munificence, in this beauty and warmth. We will continue to develop our country and protect it."